Warm carpets feel great underfoot, but they also help keep your home healthy by keeping humidity levels low, keeping dust mites and other allergens in check. Underfloor heating is a compatible heating system with carpet. Both electric and warm water systems are perfectly suitable floor heating solutions for use under a carpet floor covering. There are several benefits to having under carpet heating. First of all hygiene. Carpets tend to absorb dust. Furthermore, the hot air from conventional radiators causes the air in the room to circulate. As a result of this, they circulate the dust and impurities. Underfloor heating heats up objects rather than the air and does not cause air circulation. Radiant heat is, therefore, the most suitable heating system for carpets. The most commonly used floor heating solution with carpet is the Warmup Foil Heater. Foil Heater is specifically suitable for use with floating floors and large and regular shaped areas. The super-thin, fully earthed, flat aluminium foil will not raise the floor levels visibly, hence why it makes a great solution for renovations. The Warmup Foil Heater is an electric underfloor heating system for carpet but also vinyl, wood and other floating floor finishes. The Foil heater is made up of a fibre reinforced foil wrapped around a thin multi strand, dual core heating cable that is insulated with an advanced fluoropolymer. The foil provides a continuous earth layer within the floor construction whilst diffusing the heat away from the heating cable. Warmup has a wide range of systems from electric to wet underfloor heating to ensure the perfect heating solution for your carpet floors. When choosing your carpet flooring, attention must be paid to the overall thickness of any materials above the heater including any underlays and overlays. The underlay should have low thermal resistance and the carpet should be hessian backed to promote efficient operation of the system. A felt underlay should not be used as it may create a thermal blocker hindering the performance of the system. Everything above the heater, including underlay, overlay, and final floor finish needs to be in the limits set in the table below. The typical carpet is 1.0 to 2 tog, but you should always check with the manufacturer the suitability for underfloor heating and ensure that the overall tog value (including any underlays or overlays) does not exceed the 2.5. It is not recommended to install underfloor heating with carpet if the limits below are not met. This may hinder the performance of the system and result in the system not working as desired. When installing the system, the concrete or plywood base on which the heating system is installed on should have additional insulation. This promotes the efficient operation of the system. 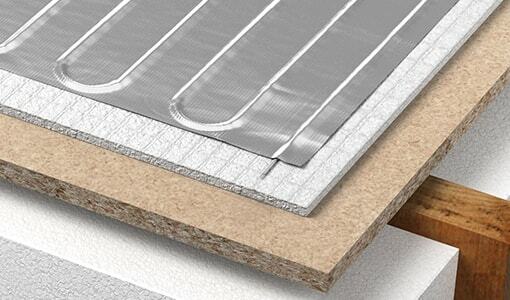 Warmup insulation boards or Warmup Insulated Underlay are designed to give the best performance for the floor heater to provide heat through the underlay and the carpet on top. The floor temperature should not exceed 81°F (27 °C), which is secured by using a thermostat, means that the floor heating system is restricted to a certain maximum heat output. If you need help determining the heating requirement of your room and deciding on the suitable underfloor heating system, our expert team is available to help and can give you an estimate for heat loss and the heat output of the system and help you to choose the right products to your home.